The Emmy Awards are starting off nicely for GAME OF THRONES this year, and fabulously for HBO. 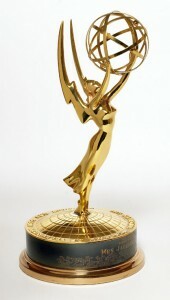 In the Creative Arts Awards given on Sunday (sometimes called the 'technical Emmys'), GAME OF THRONES took two awards. Joe Bauer ( Lead Visual Effects Supervisor), Jörn Grosshans, Visual Effects Supervisor), Doug Campbell, Visual Effects Supervisor), Steve Kullback, Lead Visual Effects Producer), Stuart Brisdon (Special Effects Supervisor), Sven Martin ( Lead Animation Supervisor), Jabbar Raisani (Visual Effects Plate Supervisor), Tobias Mannewitz (Visual Effects Concept Designer), and Adam Chazen (Visual Effects Coordinator). They won for the episode "Valar Dohaeris." For Outstanding Makeup For A Single-Camera Series (Non-Prosthetic), the series finished on top of BOARDWALK EMPIRE, THE BORGIAS, GLEE, MAD MEN, and ONCE UPON A TIME. They won for the episode "Kissed By Fire." The Emmys went to Paul Engelen (Department Head Makeup Artist), Melissa Lackersteen ( Key Makeup Artist), Daniel Lawson Johnston ( Makeup Artist), and Martina Byrne (Makeup Artist). My heartfelt congratulations to our world-class SFX team and makeup artists. Well deserved. HBO as a whole did even better, completely dominating the awards with 20 wins, way more than any other network. CBS was a distant second with 15, and the totals plunged sharply after that. Diana Rigg should have got the Female Guest star Emmy. She was top notch in every scene. I'd say you guys have a great chance next year as well, assuming there is another great wedding moment from the Ice and Fire series. I'd be lying if I said I haven't been waiting for that moment since the show began. There will be so many great moments. Another wedding to remember, a duel, a huge battle and a special father-son moment. I can't wait. But still, defeating Breaking Bad next year as well as this year will be more than tough. Just remember going in that it took The Sopranos five seasons (5!!) to finally win the award. If Breaking Bad wins on Sunday, it will have also taken five seasons, and that show achieved greatness very early on (the "Phoenix" episode is absolutely extraordinary). It's very difficult for non-traditional, non-prestige (though prestige is often mistaken for quality, sadly) shows to win the top award. It takes a confluence of factors: story (what's shown in the six tapes each series submits), timing and buzz, critical response, industry response and perception....the actual quality of the show's nominated season is very far down the list and only a small part of the equation. As I said before, my hope with Game of Thrones is after this season and how the showrunners handle season four (hopefully it doesn't take over two full episodes to get the plot going and the Dany scenes don't always end the hour), I think it will become undeniable and sooo many people will be pushing for a win, like they did for Lord of the Rings at the Oscars. But who knows? These awards are damn near unpredictable, and while they are important, in the long run when you see shows like The Wire and Seinfeld go unrecognized or barely recognized, well...LOL!! My hope is the creative team will finally get their due; people don't realize how difficult the act of adaptation is and the scope of the accomplishment you guys are pulling off. It's unprecedented, on a scale never before seen on television, with a monster cast and locations all over the world. Hope this weekend's a blast, win, lose, or draw! Great wins for the GOT - its easy to forget how much work goes into a show/movie besides the glossy stuff - acting. Also glad to see The Borgias win for costuming a really fantastic use of period correct styles, armor and accessories. Great to see historical craftsmen get some recognition. I enjoyed THE BORGIAS. An underrated show. Jeremy Irons was great, though it would be hard to cast anyone who looks LESS like the actual historic Pope Alexander VI. 20 technical Emmys speaks highly of the quality that HBO puts into its shows. The investment they put into series like Game of Thrones, Boardwalk Empire, and the rest really stand out against all the reality-based drivel that the network channels have chosen to crank out. Congratulations! I have to admit The Red Wedding was good. It was after the first season of Games of Thrones the almost (to the book) thing I've seen so far. I along with a LOT of my friends have been yelling at the TV, names you do not want to know. I had not read the novels but after seeing the 1st season I had started, I was amazed at how well they did follow the books and I (stupidely) thought, here was series that was going to go for the gold and be faithful to the novels and yes, I read all of them! I do still hunger for more of the books, but I not not watch all the current seasons episodes as I was giving myself migraines. I love Peter Dinkage's charater and hope he wins again at the emmies,but undeler the writers get their heads out of..you get the idea, I don't know if I can subject myself to more migraines. And I really loved the first one. What happened???????????? OT this thread, but let me just wish you here, a very happy B-day on the 20th. Oh, and by the way.. I hope you have a great name day! I'd love to see GOT win the Emmy this year, but the odds aren't in the show's favor. Here are the numbers from Bovada. Plans fell through for me to visit the District. Somehow, I mixed up the dates and have a three-day family moot the weekend of Capclave. I haven't canceled my reservations at The Carlyle yet; I'm still going to make a trip of it. Just with less nerd squee. So close George! so close.. This is the year of Breaking Bad.. But the next.. the next is all yours.